Princeton University Library is seeking an experienced rare books conservator to join our Preservation Department and help shape the direction of its conservation program. Many of you are already familiar with the breadth and depth of our collections which include printed books and manuscripts from across a wide spectrum of traditions and time periods. The conservator working with these collections will find many rewards. Treatment is the primary focus of the position. However, it's also important to us that the post holder is involved with the field as a whole, is thoughtful about the forces shaping it, and its future direction. We seek someone who is interested in engaging these questions on a local level to help ensure that the Preservation Office is responding to the needs of the Library, Princeton University, and the current field at large. Inquiries are most welcome. Nominations are also gratefully accepted. Applications will only be accepted at "Jobs at Princeton" and the position will remain open until filled. responsible for teaching one printmaking class per year. required for operation of high quality professional print shop. applicable health and safety standards. compliance with environment and safety standards. selection, training and use with EH&S. written guidelines for use of the shops. shops, ensuring only students who have completed training have shop access. Other appropriate duties as assigned by the supervisor. preparedness and response; and contribute to other Lab activities as needed. Part-time (20 hours/week), permanent; full benefits package. Paper Works at Art Dept. Art Dept., an intimate gallery in Fishtown, sets the scene for Paper Works, this year’s PCB member exhibition. Members, friends, and passers-by filled the space on Oct. 3. 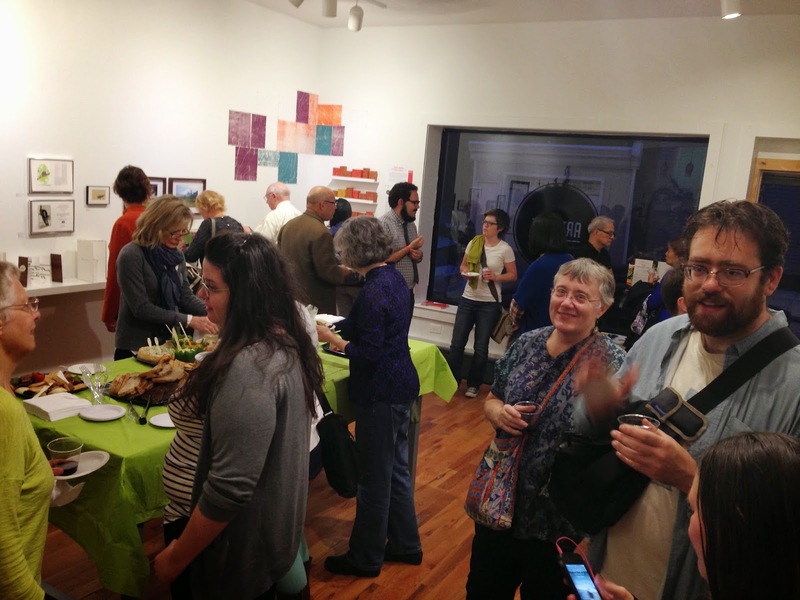 Wine and hors d’oeuvres in hand, they examined artist books, prints, and paper sculptures in a wide variety of styles and media, reflecting the artistic diversity of PCB. 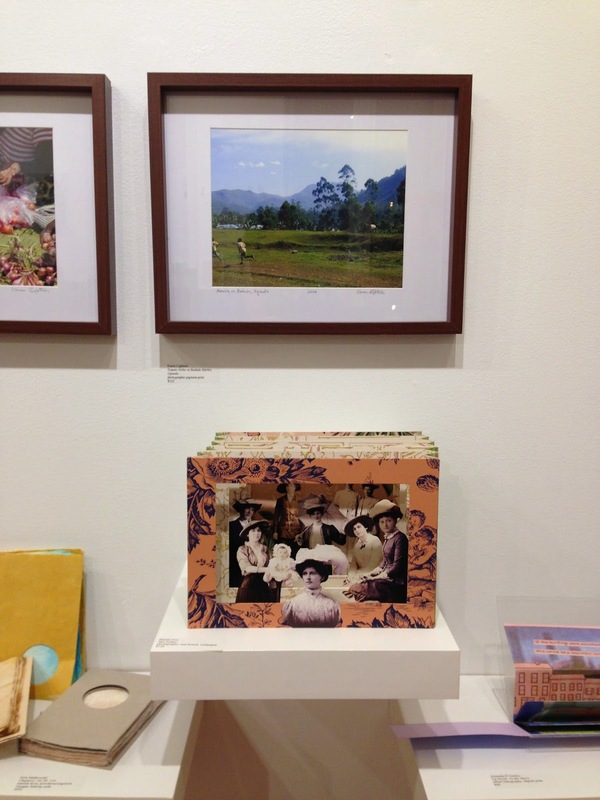 Some examples: accordion books in a number of forms; a tunnel book featuring a group portrait of ladies in old hats, extending back into the distant past; a complex story told in a series of fold-out pages gathered in a binder. On the walls: an origami hanging, evocative photographs of travels in China and Uganda; a fascinating piece spanning a corner, in which prints of wood grain morphs into lines alluding to those of a topographical map; several shelves filled with different-sized boxes offset printed with doors and windows, suggestive of the rhythms of row-house Philadelphia. These are only a few of the works on display. 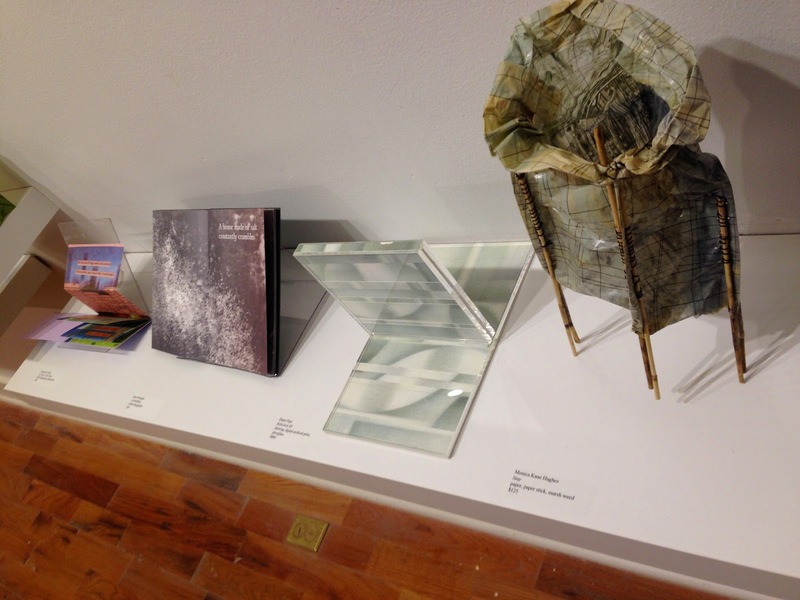 Paper Works showcases the versatility of paper and the multiple forms of printing used to transfer words and images onto it--not to mention the talents of PCB members. Paper Works is definitely worth a visit. The PCB Artists Working Group met on Sunday, Sep. 28. Donna Globus, Susan Viguers, and I got together in Mt. Airy to show/talk about what we've been up to and share problems and solutions. Donna showed us the Guild of Book Workers' collaborative project on the theme of maps. She'd brought her contribution, a map of Monday morning, to the last meeting, and it was intriguing to see how the group's comments influenced the final product. Susan gave us an update on her long-term project, The Opossum. Discussions at the last meeting brought about some changes to the title page, and we enjoyed seeing some reader's spreads with the art in place. One of the pieces I brought was a modified snake book, which evolved over a number of Working Group sessions. All of the comments and suggestions--whether I accepted them or not--made it better. There's nothing like a second--or third, or fourth--pair of eyes when you're working on a project. The Artists Working Group is a great way to get feedback in a relaxed, collegial setting. It's also stimulating to see and react to what others are doing. The more the merrier. If you're interested, contact Susan Viguers at susan@philadelphiacenterforthebook.org. Historic RittenhouseTown presents one-day introductory workshops on Fraktur and on Scherenschnitte, traditional Pennsylvania German paper crafts. Fraktur, named for an angular style of German script, is a type of decoratively painted manuscript, commonly made to mark births, weddings, and other special occasions. Scherenschnitte, or decorative paper cutting, appears in many cultures; this workshop focuses on the 19th century Pennsylvania German tradition. Philadelphia is a center of Pennsylvania German cultural studies. The Free Library of Philadelphia owns a large collection of Fraktur manuscripts. Location: Homestead, Historic RittenhouseTown, 207 Lincoln Drive, Philadelphia. Note: GPS, MapQuest, etc. will not give correct directions. All book artists jury-rig tools from time to time. 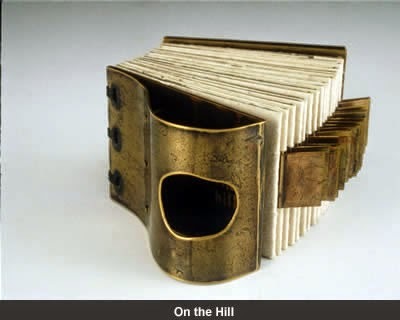 Shanna Leino is one of the few who creates tools with the same skill and creativity she applies to her artist books. People come to book arts in many different ways; for Shanna it began with an inspirational figure. "I stumbled into it really," she said. "Always interested in art, I had an art teacher in high school who was working on an epic artist book project and that was my first exposure to the concept of actually making a book. Right away I was exposed to the work of Keith Smith, Gary Frost, Hedi Kyle, Daniel Kelm and Timothy Ely...it was all over! I fell totally in love and still am." Her books show a strong interest in historical forms, going back as far as Coptic and Armenian models. Shanna is particularly fascinated by working with metals of all kinds. Recently she's been exploring textiles as well: "not sure where that's going to go." Becoming a tool maker seems to be a logical extension of Shanna's work in book art. "In high school and college, I had taken some basic metals and jewelry classes and found those very simple skills could be pushed and stretched and applied easily and naturally to book work, too. 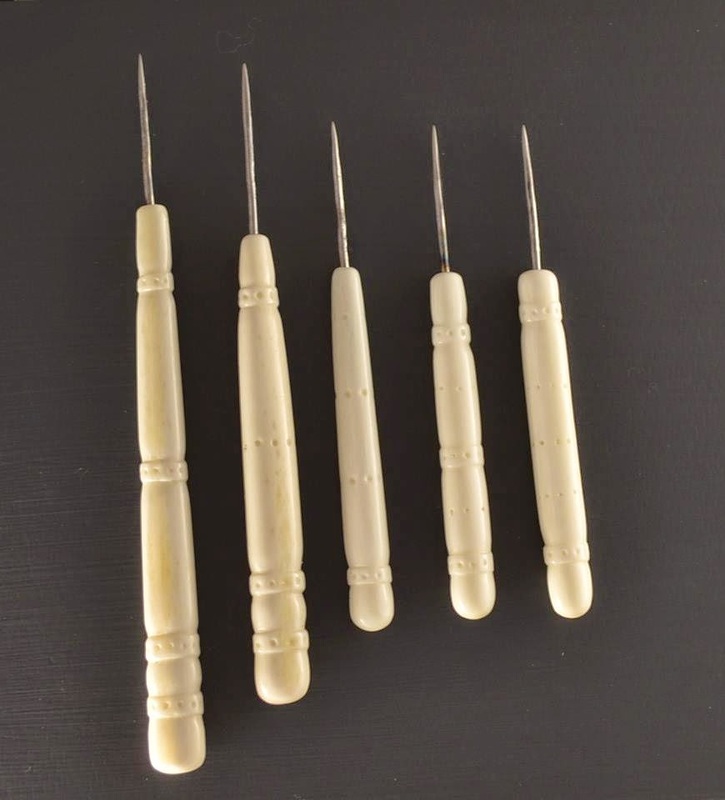 So when something came up while making books that needed that little something to make the job easier, a brass finishing tool, a specially shaped bone folder, a steel punch etc. it seemed like making a tool was the best thing to do." 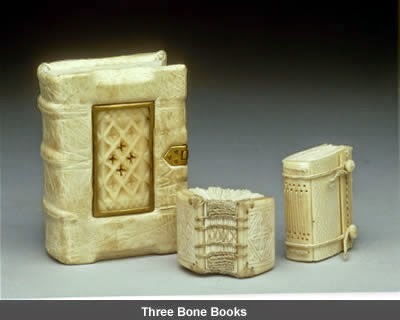 She was introduced to elk bone, "an exceptionally dense, white bone that carves wonderfully and polishes well.... Then one thing led to another and it has become a life-saving, bread-and-butter business for me, for which I am very grateful." Her tools--bone folders, awls, steel punches, and others--are available through Talas.com. 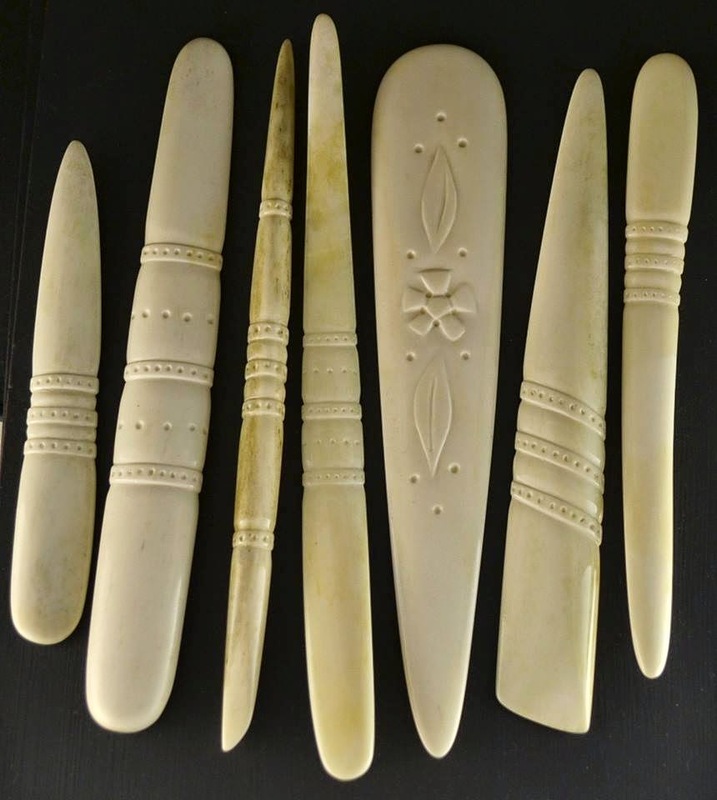 Shanna Leino will conduct a PCB-sponsored bone folder making workshop on Sunday, April 13. For details, see philadelphiacenterforthebook.org. Tyler School of Art is presenting Print Think, a one-day conference aimed at fostering conversation about the present and future of the print. This forward-looking meeting will focus on the implication of current technologies--laser cutters, vinyl plotters, 3D printers--for printmakers. The conference will be held on May 24, 2014. "PCNJ is a community based fine arts non-profit, that just celebrated 40 years of operation. We run seven programs from our location just outside of Somerville, NJ including the AIR program. PCNJ houses the ground breaking Combat Paper Program, which gives American Veterans the opportunity to come together and make paper from their worn combat fatigues as a cathartic healing process. PCNJ also runs Adult Education programs, the Roving Press children’s outreach program, exhibitions, artist collaborations, and a full-access studio where art is made. "The Artist in Residency program is a six week summer program. The artist is given time in our studios to create a body of work, a solo exhibition and $1000.00 stipend for materials and supplies. PCNJ customizes and enriches the AIR experience based on the selected artist’s needs and area of focus through artist talks, time with our Master Printer, Sheila Goloborotko and demonstrations for example. They are able to interact with other artists through the full-access printmaking studios." The Mt. Airy Art Garage will present a one-day workshop on letterpress printing. PCB member Donna Globus will teach this introduction to letterpress printing with a table-top platen press. The Grolier Club in New York City will present "Pop-Ups from Prague" in celebration of the centennial of the Czech artist, children's book illustrator, and paper engineer Vojtěch Kubašta (1914-1992). This is a rare opportunity to see over 100 works by a major pioneer of pop-up book design. If you're in New York, the Grolier Club always has an exhibit or two worth seeing; this promises to be something special. There are also several exhibit-related events, including a panel discussion featuring the award-winning paper engineer Robert Sabuda. For more information on Kubašta and the exhibit, visit: www.grolierclub.org and under "Exhibitions," click "Forthcoming Exhibitions." Dates: January 23 – March 24, 2014. "This show seeks to dispel assumptions about paper art as a medium. Paper is thought to be ephemeral meaning temporary, preliminary and disposable. We challenge these notions and look to present an exhibition that establishes paper works’ place in Fine Arts. The exhibition includes sculpture, collage, drawings, cut paper, letterpress, photography, hand-cut paper design, dimensional collage in boxes and more." 11 West Mt. Airy Ave.
Come out to meet and support local artists.